Nazareth (English pronunciation: /ˈnæzərəθ/) (Hebrew: נָצְרַת Natz'rat or Natzeret; Arabic: الناصرة‎ an-Nāṣira or an-Naseriyye) is the capital city of the north district of Israel. Most of the people in this city are Arabs (who are either Muslim or Christian). There are also some Jewish people. 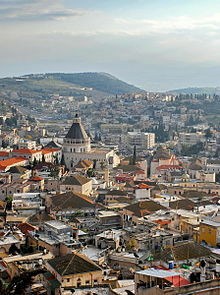 The city is very old and is also famous for being the city where it is believed Jesus grew up. This page was last changed on 18 February 2019, at 19:21.